Fort Lauderdale, FL – America’s official gas price retreated from the $3.00 threshold this week, even as prices had raced toward that critical level for weeks. According to the U.S. Energy Information Administration, the nation’s average gas price dropped just over two cents per gallon to $2.94. The figure was released in the weekly fuel price survey Monday evening. 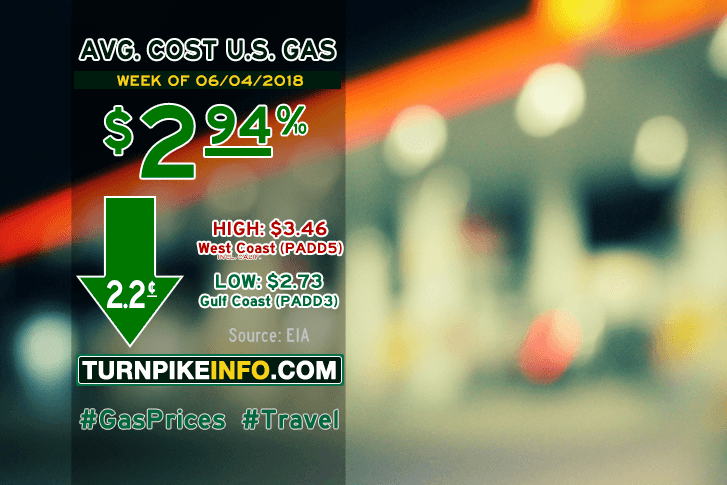 Prices went did not go down in all regions, but many drivers along the East Coast and Midwest were given a solid break on prices at the pump this week, according to the E.I.A. survey. Prices along the Gulf Coast and in the Rocky Mountain states went up slightly, while prices in California helped keep West Coast averages down this week. Truckers, on average, got a slight break this week, although the nature of that break comes in the dubious form of flat fuel prices. For the first time in weeks, the E.I.A. reports average diesel prices remained most flat, holding steady at about $3.29 per gallon. This week’s average fuel prices for all regions are shown below, as gathered from www.eia.gov.